As the weather starts climbing to higher degrees, we all yearn for cooler comfort – more and more. If central air conditioning is not an option, room air conditioners are the more affordable and energy-efficient alternatives. However, finding the right air conditioner for your space is not as easy as plugging in an electric fan and turning it on: an air conditioner that’s too small will not cool an entire room evenly, while an air conditioner that is too big or too powerful will cool a room so quickly, there will be no time for it to remove the room moisture, leaving you with a cold, damp space. In a nutshell, one will want to think about machine noise, location and number of windows, installation requirements, optimized cooling capacities, and after-sales support (warranty) that comes with the AC unit. 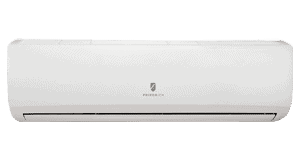 The brand name of the air conditioning unit can help point us immediately to its strengths and weaknesses. Friedrich manufactures commercial-grade air conditioners for all conceivable residential and commercial applications, be it for individual office spaces or multi-room facilities. They are built to withstand even the most-challenging environmental conditions. Friedrich's extensive line of Window, Thru-the-Wall, Portable and Ductless units showcases a world of choices. Friedrich lines include Cooling Only and Cool+Heat solutions with features, capacities and energy ratings suited for any residential or commercial demand. During the 1950’s, Friedrich was a known large manufacturer of commercial refrigeration equipment. It ventured into the then relatively new field of air conditioning in 1952 with its initial window air conditioning offering. Friedrich has been credited with several innovations, including introducing the first refrigerated display case used by food retailers. Friedrich is often recognized for its top-grade quality internal and external components and, even more importantly, the relatively lower cost of operation and maintenance. Many Friedrich Cooling and Cool+Heat solutions have energy-saving features such as programmable thermostats and timers, and energy-efficient settings that reduce costs of operation. 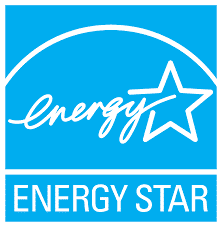 In addition to Friedrich’s initiatives in energy conservation, it enjoys Energy Star®,certification, one of the world’s leading standards for promoting energy-efficiency and sustainability. Energy Star-qualified air conditioning systems are at least 10% more energy efficient than the minimum federal standards. As with any given service or product provider, Friedrich has its fair share of negative feedback. One issue that often comes up is the lack of availability of parts for units eight years old and older. At least one unhappy user has further claimed that a professional from Friedrich actually told him that eight years is about what one would expect as far as a Friedrich AC’s longevity goes. This casts a negative light on Friedrich – impressing on users that the company operates on planned obsolescence for its products. A few Friedrich customers cite product malfunction right out of the box. However, we and other professional HVAC contractors find that premature component failure in HVAC units, Friedrich included, is almost always due to improper installation. Friedrich manufactures window, thru-the-wall, portable and ductless AC units fit for individual office spaces to multi-room properties -- even for the most challenging hazardous environments. Read on for the cooling and cool+heat solutions that Friedrich offers, with the features, capacities and energy ratings best for your needs. Kühl is one of Friedrich’s room/window models, recognized for its quality and ease of control. It features intuitive controls that allow one-touch operation as well as programmable control which allows you to easily switch between operating modes, fan speed, and temperature with just a push of a button. Kühl is equipped with a 7-day energy management programmability with LCD lockout. It also allows wireless unit operation, making controlling a Kühl from a smartphone, PC, or tablet possible. You can create and save up to six custom schedules per unit (optional Friedrichlink™ KWIFI accessory required). It is built with a commercial-grade, 20-gauge steel cabinet and fully-enclosed fan motors with a unique real aluminum grille that protects the unit from damage. Aluminum endplates prevent rusted condensate from pooling in the drain pan, eliminating rust stains on your structure. Internally, Kühl operates with robust, fully-enclosed fan motors that run at lower temperatures to prevent overheating. Kühl units deliver power of 5,800-36,000 BTU/hr. Chill is another line of Friedrich’s room/window HVAC units, available in Cooling Only and Cooling + Electric Heat. Relative to the Kühl line, Chill is up to 29% lighter across its equivalent models. It features a slide-out chassis that significantly simplifies installation and maintenance. All the models in the Cooling Only line are Energy Star® qualified (with the exception of the CP05G10B). The MoneySaver® setting in the Cooling Only models saves money by conserving energy. Chill units come equipped with the Auto Air Sweep feature and have capacities from 5,450 BTU/hr to 23,500 BTU/hr. Chill is reliable to evenly cool a single room or a large open space. All models include a remote control. 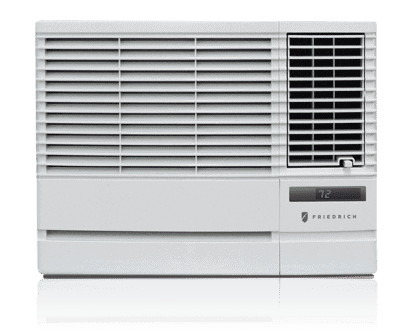 WallMaster is Friedrich’s commercial-grade thru-the-wall Cooling Only, Cooling + Electric Heat, and Heat Pump line. The WS08D10A and WS10D30A of the Cooling Only models are Energy Star® qualified. WallMaster is constructed with top quality materials and rugged components, ensuring its durability and quiet performance. WallMaster is built into a heavy duty 20-gauge cabinet and equipped with robust, fully-enclosed fan motors that run at lower temperatures to prevent overheating. EntryGard™ anti-intrusion protection uses a steel retaining wire that secures the chassis to the sleeve. WallMaster is manufactured with high-efficiency compressors that are mounted on extra-thick rubber grommets that absorb motion and sound. Plus its solid steel blower wheel housing allows for maximum sound reduction. Uni-Fit® is Friedrich’s solution for 24.5", 26" or 27 ½" sleeves, without the complicated, time-consuming retrofits. This small Thru-the-Wall air conditioner is designed to fit virtually any typical sleeve size quickly and cost-effectively. Uni-fit is built with a solid-side sleeve that has no side vents and can be installed through walls up to 16 1/4" without compromising performance. Obstructions to an air conditioner’s side vents restrict air flow, diminish performance, and likely void the unit’s warranty. Uni-Fit’s smaller dimensions may require the use of the included trim ring to bridge a small gap between the unit and the existing sleeve. The trim ring will fit gaps up to 1" on the sides and ½" on the top of the unit for a neat, finished appearance. All models include a remote control. Floating Air is Friedrich’s Wall-Mounted Ductless Split line that boasts of exceptional value. It features variable-speed compressors and fans (called Inverter Technology) that allows it to reach the desired temperature level much quicker, maintain the temperature level more accurately, and reduce energy consumption with fewer compressor start-ups that can be expected from traditional technology. The Floating Air line showcases power from 9,000 up to 36,000 Btu. Floating Air is also available in Heat Pump models. The Friedrich J Series are wall-mounted systems perfect for single and multi-room configurations. With the Friedrich J Series, you can choose from single-zone cooling models, single-zone heat pumps that cool and heat, and multi-zone heat pumps that individually cool and heat multiple rooms. 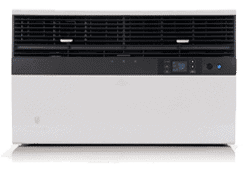 Friedrich wall-mounted ductless split systems feature the Inverter Technology that eliminates the constant compressor start-ups and shut-downs required to keep the desired or set temperature that happens with traditional technology. Inverter Technology controls compressor rotation speed with precision and adjusts capacity accordingly to the demand, which reduces energy consumption. Hard-to-find 115V 9000 and 10600 Btu/hr models are available within the J Series line, with capacities of up to 2 tons. 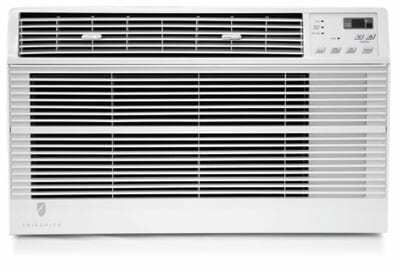 Friedrich is a smaller, generally pricier brand of window and ductless split air conditioners available at regional appliance retailers. Window and ductless split AC units range from $200 to $1,200 in cost. Friedrich manufactures units with BTU ranging from 5,000 to 24,000, most of which are Energy Star® certified. A window-type air conditioner is generally easy to DIY. All you need is to ensure that you have the right-size window or wall passage. Supporting brackets are ideal and a close-enough power outlet is necessary. But installation of a ductless split air conditioner is going to require a qualified installer. Generally, it is the same company selling the equipment as it is installing it, though you may be able to seek out quotes from several independent contractors before making your decision. Quad - BTU of 24K, SEER rating of 16.5 or higher, and a price of $3800 or higher for the equipment. For window or through-the-wall units, the end of the season is usually a time when retailers are trying to clear out inventory. So it’s good to plan ahead for next year’s warm season and purchase once summer has wound down. For ductless systems, it’s also good to plan for a fall or winter installation when contractors have more time and are looking for work to do. It’s often easier and cheaper to have the installation done during this time period. Friedrich was founded in 1883 by Ed Friedrich in San Antonio, TX. Friedrich was a craftsman who initially designed furniture and later produced other handcrafted products. Friedrich, also an innovator and inventor, ventured into food preservation and developed one of the first refrigeration systems. By 1950, Friedrich had become one of the world’s largest manufacturers of commercial refrigeration equipment. Expansion moved towards the manufacturing of room air conditioners. The first 500 floating air window units came off the assembly line in 1952. 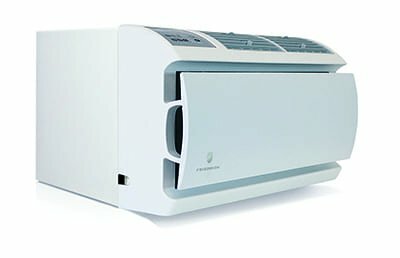 Decades later, Friedrich has kept its reputation as one of the most recognized room air conditioning brands, known for commercial grade durability and energy efficiency. In the early 80’s the Friedrich brand was acquired by ARCO. In 1985, it became known as Friedrich Climate Master Inc. selling water source heat pumps. By 1987, the Friedrich trade name was dropped and Friedrich HVAC products became known as Arcoaire. 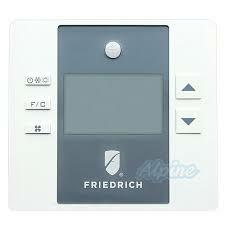 However, the Friedrich brand name was still used on window units and mini splits after its purchase by Zoneaire. In 2010, That same year, Friedrich introduced Kühl, a new line of advanced, commercial-grade room air conditioners. Kühl established a new category standard, fitted with innovations in control, customization, quality, efficiency and design. Friedrich HVAC has proven steadfast in its commitment to helping customers find the right cooling solution for virtually any application. 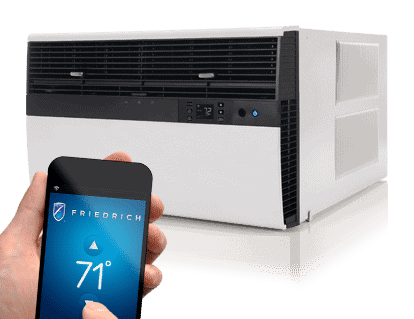 Friedrich’s expansive product line includes a range of options for the residential and commercial markets, including room air conditioners, thru-the-wall units, ductless split systems, packaged terminal air conditioners, portables, and dehumidifiers. With commercial-grade manufacture processes for all its residential and commercial targets, the bottom line is that Friedrich is a trusted HVAC brand that’s been present for many decades now.